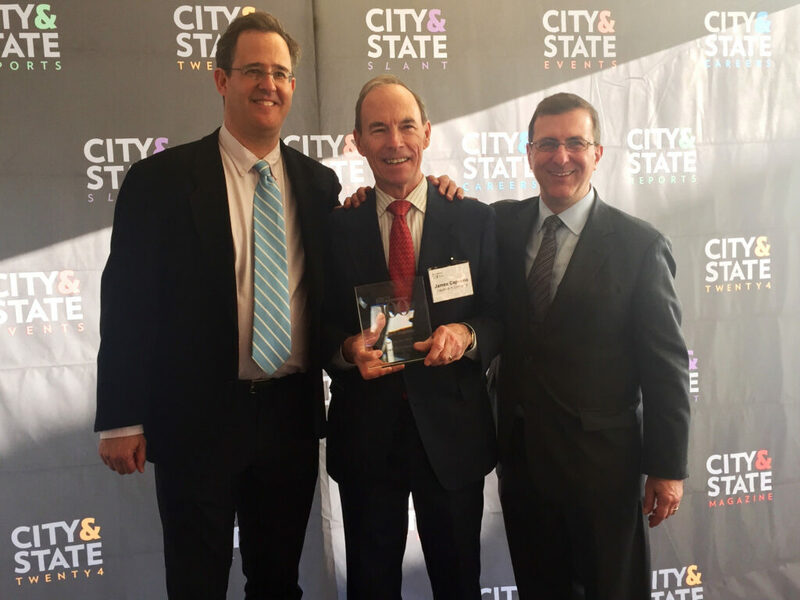 City&State selected Capalino+Company CEO Jim Capalino as one of The Responsible 100 – representing New York’s 100 most outstanding corporate citizens. Jim joined this year’s honorees at The Responsible 100 Gala luncheon on December 15th at Hunter College in Manhattan for an award ceremony. This is well-deserved recognition for Jim’s longstanding commitment to corporate citizenship. In 2014 Capalino+Company solidified this commitment with the establishment of a dedicated Corporate Social Responsibility practice area. As one of New York’s premier problem solvers, Jim has played a critical role in making possible some of the most important civic projects in the last four decades of New York City history. See our clients here. The Capalino+Company team from left to right: Lindsay Safran; Jeanne Mullgrav; Alfred Griffin of NY Green Bank; Cathleen Collins; Jim Capalino. Special congratulations to our clients and partners who were honored as The Responsible 100, whose hard work and dedication to corporate responsibility is an example to all New Yorkers. NYC Police Commissioner Bill Bratton served as the keynote speaker and kicked off the program by highlighting important updates to New York’s policies, public safety, and being a good citizen in our communities. Acknowledging the crowd, he explained that good policy was created by strong leadership, effective public safety and a commitment to giving back and supporting our communities. He emphasized that we do not need to choose between public safety and supporting our communities: these two notions work together. “It’s a shared responsibility of all of us to successfully address problems of our community,” said Commissioner Bratton. 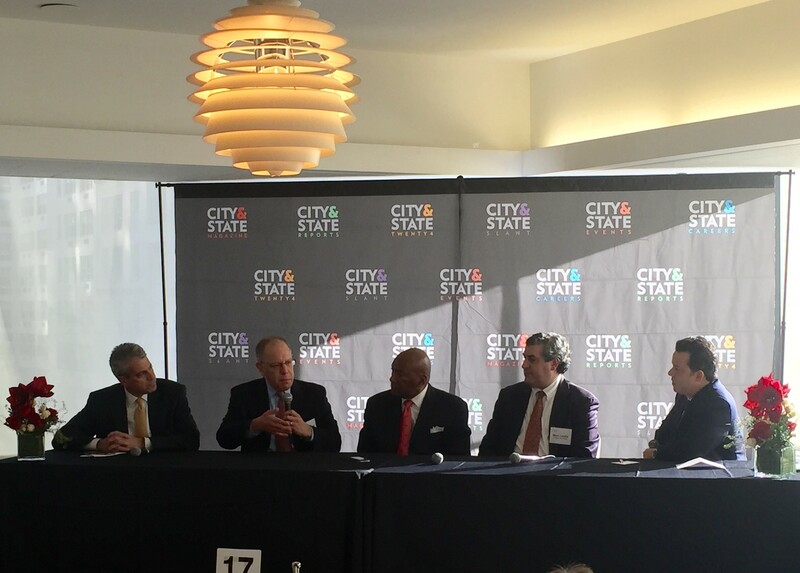 Daily Beast Editor-in-Chief John Avlon, who emceed the award presentation, moderated an insightful panel discussion with honorees Seth Diamond of MetroPlus, George Hulse of Healthfirst, Mark Landis, Phillips Nizer LLP and Mitch Roschelle of PricewaterhouseCoopers. From left to right: Mitch Roschelle of PricewaterhouseCoopers; Seth Diamond of MetroPlus; George Hulse of Healthfirst; Mark Landis of Phillips Nizer LLP; John Avlon, Daily Beast Editor-in-Chief. The panel emphasized the importance of utilizing public private partnerships and leveraging technology in order to implement a successful CSR program. They also discussed strategies for devising a meaningful CSR initiative that also supports the company’s bottom line. programs to invest their time, talent and resources in the communities in which they operate.